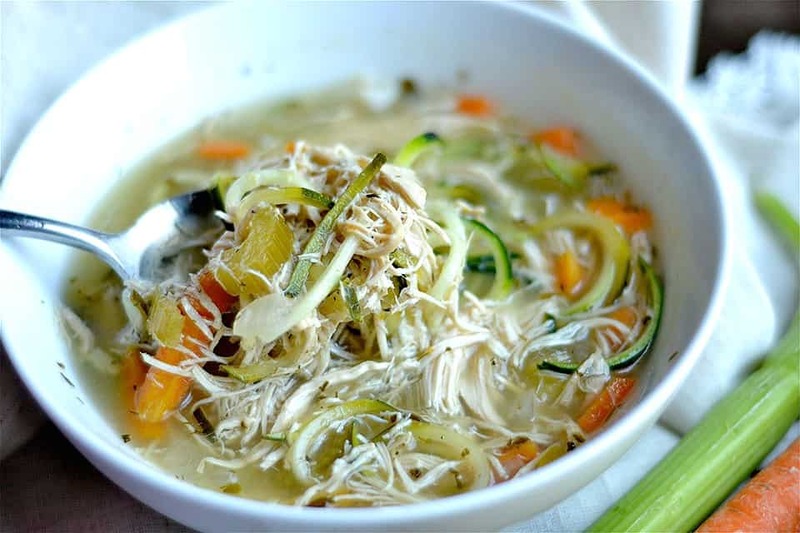 Slow Cooker Chicken Zoodle Soup is your favorite classic soup with a zucchini noodle makeover! Less than 10 minutes of prep time and dinner will be ready when you get home. 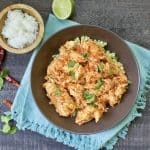 You can also throw this recipe in the Instant Pot! 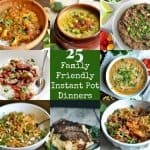 The perfect comfort food for the entire family is so easy to make! Three out of the four members of my household are coming down with some kind of yuckiness. Tis the season! So far I’m the lucky one spared (knock on wood). So of course this momma is in full nurturing mode. I made a batch of my slow cooker beef bone broth for everyone to sip on, (myself included), and thought some chicken noodle soup was in order. If I’m being perfectly honest, chicken noodle soup is a little boring to me. So it’s not something that I get super excited about making. It needs some more flavor. So don’t worry, I took care of that for you in this version. I’ve added a ton of fresh and dry herbs, some lemon pepper, and even apple cider vinegar for a little tang and for added nutrition benefits! As I always like to remind people, herbs count as vegetables. They are packed with nutrition, and such an easy way to add flavor to food without increasing things like salt, fat, and sugar. So back to my little family of sickies…….They loved this soup. Easy to eat, and comforting for everyone. It made a pretty large batch, enough for us to have leftovers (or freeze for later use). They also thought the addition of zucchini noodles was pretty fun. Just a side note, be sure to add them toward then end of cooking time (like the last 30 minutes). That way they have a more “noodle” consistency. Now would also be a great time to mention, you can use leftover Thanksgiving turkey!!!! Oh yes, what a genius idea. Not really, I’m sure you’ve already thought of that. 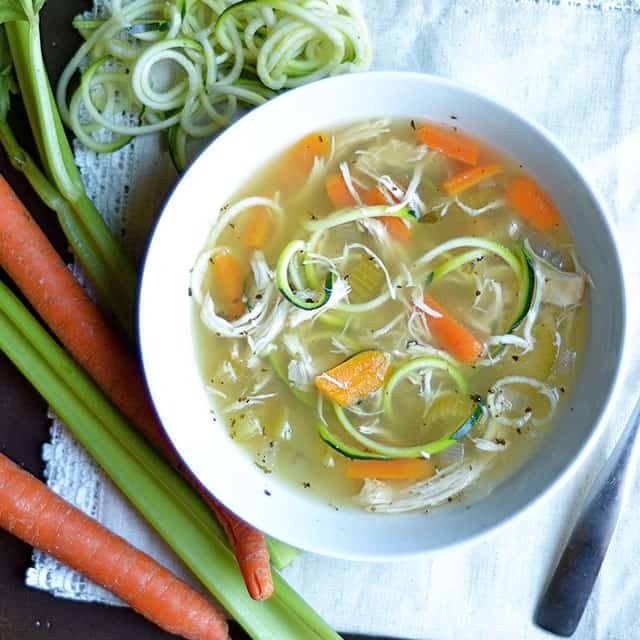 This soup uses raw chicken breast, but you can most certainly add your Thanksgiving turkey to pot. It will soften as it slow cooks, and break down into shredded pieces. And if for some reason, you’re feeling like you want some more flavor, go ahead and add a few tbsp of buffalo hot sauce to your bowl. I *might* have done that. I’m not the sick one, remember?? 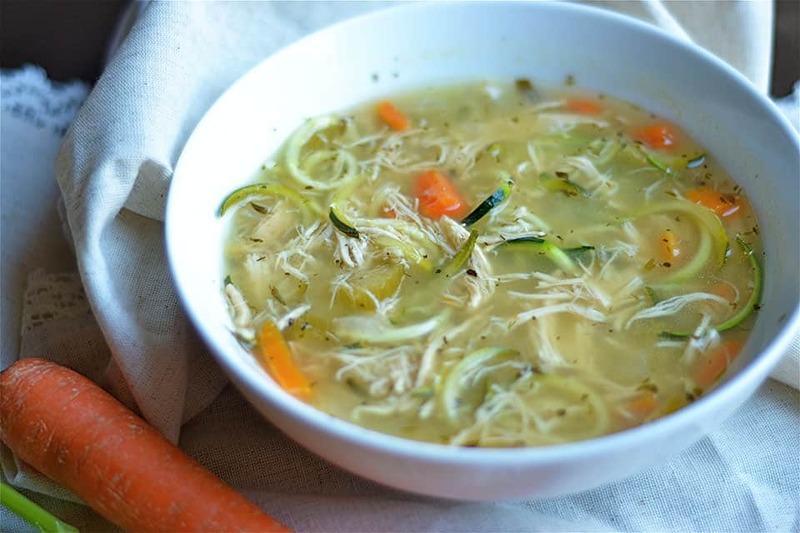 Place chicken and vegetables (not the zucchini), in the bottom of your slow cooker. Top with chicken broth and apple cider vinegar. Add in all the fresh and dry herbs. Cover your slow cooker and set heat to low. Cook for 6-8 hours on low (it can be done as early as 6 hours, but totally fine to leave it to 8 hours for the flavors to meld and chicken to soften). Break up some of the chicken with a fork so you have smaller pieces. Add zucchini noodles and cook for an additional 30 minutes (or until noodles are soft and easy to eat). Serve with additional salt and pepper to taste. Follow the exact same directions above, but throw ingredients (up until zoodles) in your instant pot instead of slow cooker. Select manual, and cook on high pressure for 10 minutes (for thick chicken breast). If your chicken is smaller you can do 8 or nine minutes. Use a quick release. Once the venting process is complete, remove lid and stir in zoodles. Top with extra salt and pepper to taste. I made this tonight and the spices, oh my, so flavorful! Thank you for such a great recipe. I worried never heard of adding vinegar? Did you put the apple vinegar in the soup. 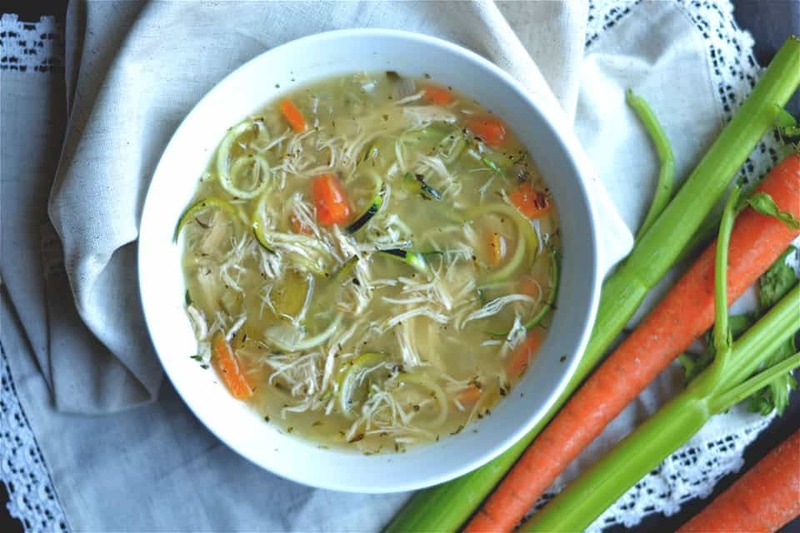 Hi Judy, the apple cider vinegar adds an element of tang giving the soup a slightly acidic flavor. I love tangy foods! You can omit, or start with just a few tablespoons to see how you like it. Would this warm up well throughout the week? 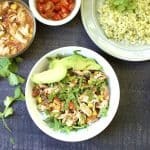 Looking at possibly making this for my lunches for the week! This did not work out well at all. The cider vinegar curdled the broth and gave an acrid flavour to the soup. Just made this and love it!!! Do you have the nutritional facts on it by chance? !